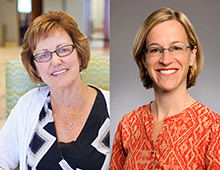 Emory faculty members Corrine Abraham (Nell Hodgson Woodruff School of Nursing) and Anne Tomolo (School of Medicine) have worked together in care and training at the Atlanta VA Medical Center (VAMC) for three years now, and their latest collaboration is a new center to coordinate care for patients with dementia. The Specialty Care Education Center of Excellence for Cognitive Disorders, co-directed by Abraham and Tomolo, is funded by a $1.5 million three-year award from the Department of Veterans Affairs. In addition to coordinating care, it will provide a platform for teaching Emory nursing students and medical residents and fellows and social work students from other schools as part of interprofessional teams. "The center will help bridge the gap for patients by integrating telehealth and shared appointments with team members specializing in neurology, psychiatry, geriatrics, palliative care, and social work," says Abraham, who is coordinator of evidence-based practice and innovation in nursing at the VAMC. "Students will learn about specialty care for cognitive disorders with an emphasis on teamwork, collaboration, and quality improvement." "It's important to have an entity that brings specialists and students together around patients and their families," says Tomolo, who is chief of quality medicine and site director for postgraduate training in quality and safety at the Atlanta VAMC. "The other crucial piece is integrating quality improvement into the curriculum so that students learn how to build a clinical model and improve practice together." Currently, veterans with dementia enter the Atlanta VAMC through multiple pathways, either via their primary care physician or various specialists. The new center will consolidate their care. Instead of being evaluated by different specialists in different locations at different times, veterans first will be assessed via phone by a nurse coordinator before they come to the VAMC for a clinic visit. Next, specialists in neurology, geriatrics, psychiatry, and eventually palliative care will decide as a group how to manage patients through shared appointments. After seeing patients, the care group will meet to develop a care plan and refer veterans and caregivers to VA and community resources. The nurse coordinator will follow up regularly by phone to help manage their care. During clinic visits, nurses and social workers will meet with family caregivers to assess their needs. One option for caregivers will be Tele-Savvy, an online distance-learning education program for dementia caregivers developed by Emory nursing professor Ken Hepburn and colleagues. The program provides self-guided individual instruction and connects groups of caregivers for weekly chats online. Hepburn is now instructing center staff on using Tele-Savvy as an intervention. "It's an ordeal to get a patient with advanced dementia out of the house to go to the doctor," says Abraham. "Tele-Savvy will provide caregiver support in the home and through peer-to-peer support, which will help caregivers cope with their loved ones' condition and manage their own anxiety and depression." The center is currently in startup phase, and Abraham and Tomolo are immersed in hiring new staff, developing a program evaluation plan with public health faculty member N-goc Cam Escoffery, and piloting a curriculum for psychiatry residents from Morehouse School of Medicine, also a partner in the center. Other Emory faculty involved in the center include Nirmala Bangalore and Thomas Wingo, who lead existing VAMC clinics in mild cognitive impairment and neurology, respectively.